The Toyota Online Parts Catalog at Hamer Toyota maintains a comprehensive inventory of high quality Factory Genuine Toyota OEM Parts. Factory Toyota air filters, oil filters, spark plugs and Toyota body parts too. Genuine Toyota Parts are manufactured specifically for your Toyota’s year and model vehicle. They’re just like the parts your vehicle was built with, so they’re the best choice in terms of fit, performance and overall quality. Don’t forget to check out our Toyota Parts and Accessories Special Offers.Own a Scion? Your Scion will receive proper care by trained technicians using Genuine Toyota Parts. 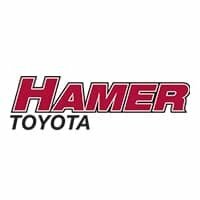 Hamer Toyota is proud to be an authorized Yakima Dealer. Give us a call for more details or to order your Yakima parts and accessories. Keeping your vision of the road ahead clear from environmental elements is a vital aspect of safe driving. Toyota Genuine Wiper Blades are designed with exact specifications for your vehicle with the proper size, windshield curvature and moisture removal to help keep your vision clear when driving in inclement weather conditions. Order Genuine Toyota Wiper Blades from Hamer Toyota to keep your Toyota a Toyota. Need your Toyota Genuine Wiper Blades installed? Our Toyota-trained technicians right here in Mission Hills at Hamer Toyota can quickly handle all of your Toyota Wiper Blade replacement needs.